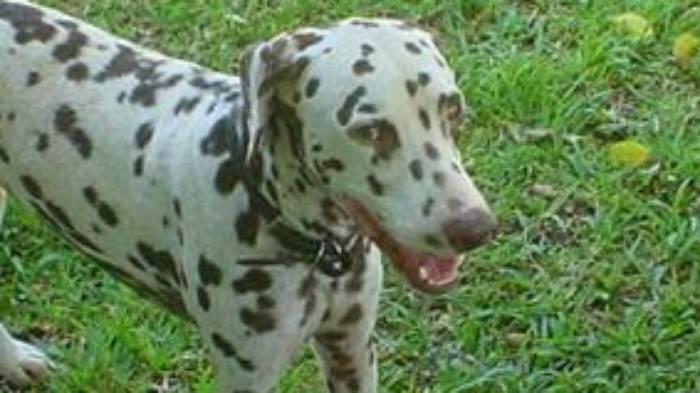 My first and so far only dalmatian was called Adonis, just the perfect name for a perfect and so handsome puppy. When he was born to a neighbor hobby breeder of mine, I went to look at the litter of 8 and though, "no way, I don't want an all white dalmatian, I want one with spots". But then I was told by the specialist that they are all born without any spots and don't develop them until they are 3 to 4 weeks old. It was true. As for character, what a nice breed they are. so confident and friendly with the owner, the rest of the family and also with other dogs or other pets like cats, birds and hamsters in the house. I have heard that after the movie hype of 101 and then 102 dalmatians in the mid 90's the breeding went out of proportions a little bit and some characteristics were not as developed afterwards as before. I think that nowadays I would only recommend a professional breeder or adopt an abandoned dalmatian. I would like to point out several health issues that I experienced with this breed. It is said that some 30% of dalmatians suffer from deafness, that's a lot. I was lucky with Adonis, just after beeing 10 years old I felt like his hearing went down a little bit but I am sure it was due to old age. But yes, did he suffer from allergies! To cleaning products in the house, to food, to environmental issues. I constantly had to have him tested or give him a new kind of medication or apply a cream. With time you learn what affects them and actually it's great for your own health to switch to biologics for cleaning the floors or not use room sprays at all. So I managed to control a lot of his allergies. One big issue is the flea and tick prevention. As they are so allergic, you need to check with your vet if a certain product is okay for them or not. As sometimes one rather tries with natural products and maybe they don't work to well, Adonis developed lime disease and had several attacks of severe nature. But there are now certain safe products out there for them to use and your vet will tell you what he recommends. They also have a possible issue with urinary tract health. Certain foods are off therefore like a little piece of extra liver from the butcher. I recommend a special balanced dry kibble for them, again, better approved by the vet. In German there is a saying and it can be only translated some 80% but I like it to describe this breed. "A Dalmatian always wins - he always has the most points!" Thats as in German points are translated to spots with a double meaning -spots and points. That is how I would describe Adonis, a clear winner in all points!